Trichomoniasis and Hexamitiasis in racing pigeons. A magistral prepared water soluble powder with a combination of 2 Imidazol compounds Dimetridazol and Ronidazol. 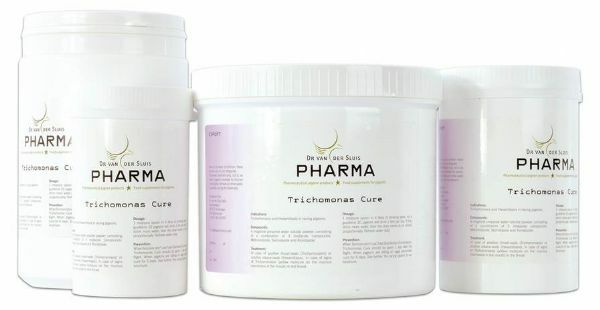 When positive throat-swab (Trichomoniasis) or positive cloaca-swab (Hexamitiasis) When signs of Trichomoniasis (yellow moisture on the mucous membrane in the mouth) in the throat. 1 measure spoon in 4 litre water. When fanciers don’t use the Disinfection Combination then give Trichomonas cure 1 day after the flight. And for 6 days when the pigeons sit on eggs.